The 6th Annual BV Strong Community Dinner will be Monday, September 23, 2019 from 5:30 – 7:00 pm. Join us with your friends and neighbors at dinner down the middle of Main Street, with the majestic Collegiate Peaks as our backdrop. We are a community that’s diverse in opinions and ideas; yet on this night, we focus on all we have in common as we eat together at one table. We embrace the people we love and celebrate those we’ve lost, cheer our accomplishments, and anticipate the return to “just us” as the summer season winds down. All are welcome, and there’s a seat for everyone at our table. Our beautiful views are surpassed only by the beautiful people who call BV home! The simple mission of the BV Strong Community Dinner Planning Team is, “Just dinner!” We strive to create a locally-funded and locally-organized annual activity where the residents of Buena Vista come together in a nonpolitical, noncommercial, non-promotional event to share food and friendship as we celebrate and nurture a sense of community. More than most communities, Buena Vista knows that magic happens when we sit down and eat together. 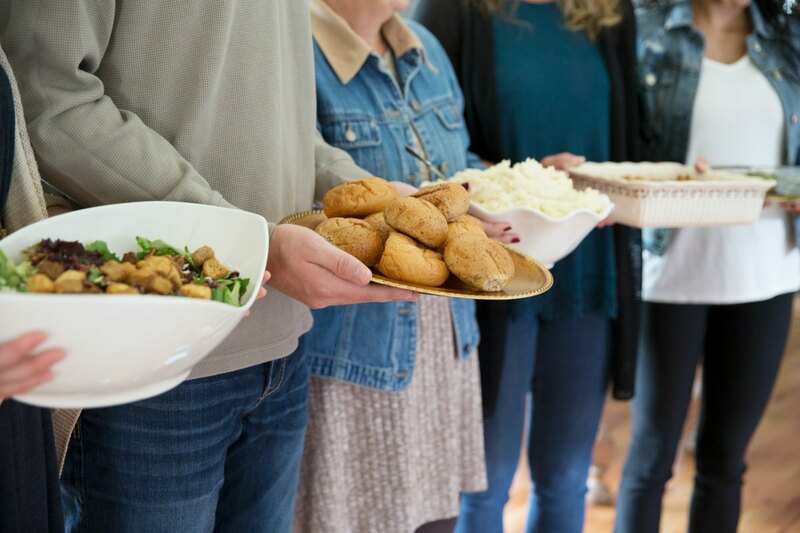 We will continue our annual tradition of hosting the free BV Strong Community Dinner on Main Street, and you can create a new tradition by hosting a smaller BV Strong-ER Neighborhood Dinner on YOUR street any time of the year. We’re providing lots of tips, ideas, and suggestions so your neighborhood can experience the same closeness, unity, and sense of safety we all feel when we sit down and share a meal together. Let’s make BV even STRONG-ER. Get to know your neighbors and where they live. Increase a sense of belonging within your neighborhood. Learn a little about each other and know who might need a little extra help from time to time. Meet neighbors nearby and the skills you offer one another—they might be able to help you with a gardening problem, or lend you that needed ingredient for your recipe. Help with safety/crime prevention by knowing who lives around you. Develop an opportunity to meet some of the older neighbors and discover your neighborhood’s history. Just to have fun! No excuses or reasons are needed to celebrate. The dinner is FREE to attend for all our guests, and there is no cost to host a table! This is only possible through generous donations from your fellow neighbors and local businesses right here in BV. Your gift will be used for expenses such as table and chair rentals, sanitation, centerpieces, table signage, and other set-up costs. The BV Strong Community Dinner is a 501(c)(3) non-profit public charity, and your gifts are tax-deductible. We encourage you to talk to your neighbors, friends and coworkers to find available seats. You can also use our Facebook group to find seats. Please email our Table Planning Team at bvstrongcommunitydinner@gmail.com to inquire about a table reservation. Thank you! Seating 3,600 neighbors at 450 tables takes an epic team of volunteers! Please consider donating your time to help with special projects, set up before the dinner, and tear down after the event. Please join our Facebook group for ongoing information about helping at BV Strong. Stop by Watershed, 410 E Main, to paint a custom tile that we will incorporate at the dinner. We will post other special projects at our Facebook group as they are planned. Set up is on Main Street on Monday, September 24, at 1:00 pm. Volunteers unload tables and chairs and place them according to our map. We will also place a centerpiece on each table. Clean up begins at 7:00 pm, so feel free to stick around after dinner! Volunteers carefully stack chairs and return tables to the delivery trucks. We also make sure no trash is left on Main Street. Sign up to receive updates about the BV Strong Community Dinner. You can also join our Facebook group!